The Craig Diez Team is proud to welcome its newest team member and distinguished Sales Associate, Bridget Gray. 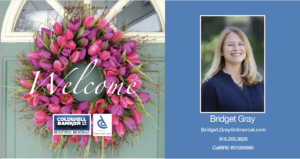 Being a local resident since 1996, Bridget has lived, worked, and grown her book of business in the greater Sacramento area and beyond, making her a reliable source to turn to for real estate trends and information. Her strong market knowledge and her reputation for honesty, integrity, and fair play have earned her the respect of clients and peers alike. Bridget has over a decade of active participation as a volunteer and fundraiser for PTA, MOMs Club, local scholarships, community theater and youth sports. Her close-knit ties with the community, coupled with her approachable style and firm understanding of the real estate market make her an excellent addition to the team. We look forward to being a part of your many successes ahead! "After working with an agent who did not appear to be actively promoting our property, we hired Michael Martz, Craig Diez, and his team to sell our home.... continued"